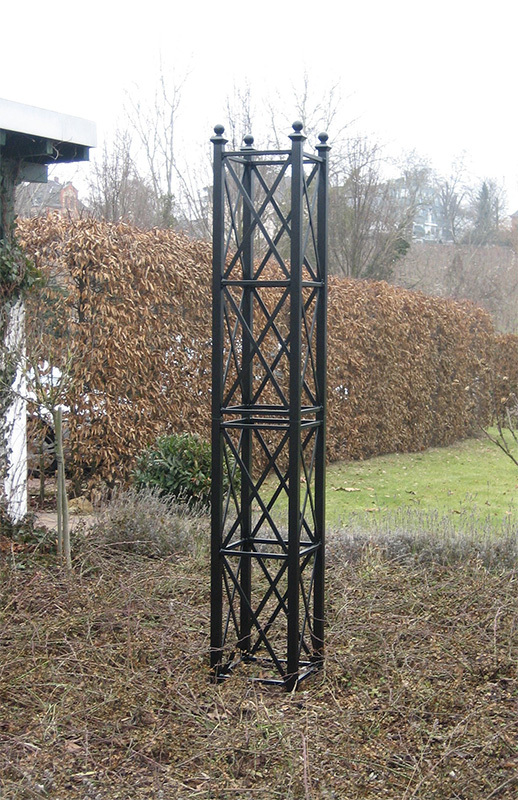 The “Eltville” is made of 1.57” (4 cm) steel tubing and 0.79” (2 cm) steel-bands. Hot-dip galvanized and powder coated black. The “Eltville” needs to be firmly secured to the ground using four steel anchors (provided) put in concrete. It is made in one single piece. Other colours on request. 10 years guarantee against rust. 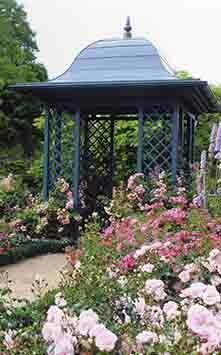 Sculptures, pavilions and three-dimensional plant supports can lend structure and cohesion to a garden in much the same way as formally trained plants. Even in the depths of winter, they create an atmosphere of peacefulness and contemplation. 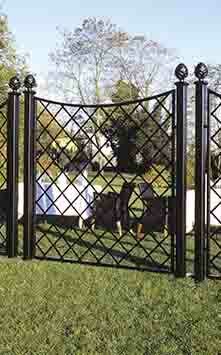 It is important that such features harmonise both with the architecture of the house and with the style of the garden. Taste varies of course, and well-chosen, stark contrasts can also create a stunning effect. As a rule, however, a contemporary sculpture will look better against the backdrop of a modern house, while a neo-classical building is a more favourable background for a neo-classical statue. So, it can often be difficult to find the right place in your garden for a work of art, particularly for a figurative sculpture. By contrast, geometrical forms fit in easily almost anywhere. 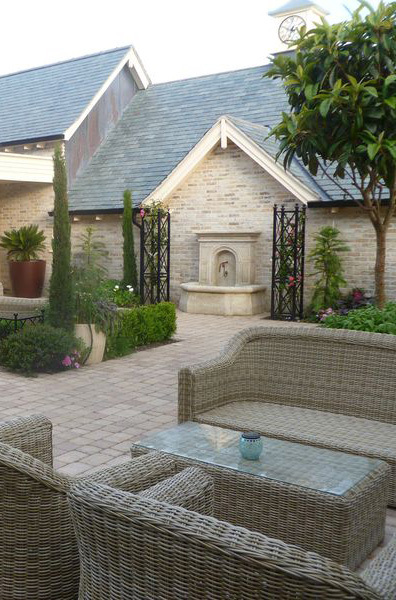 Pyramids, columns and globes go well in any garden and complement practically every architectural style. 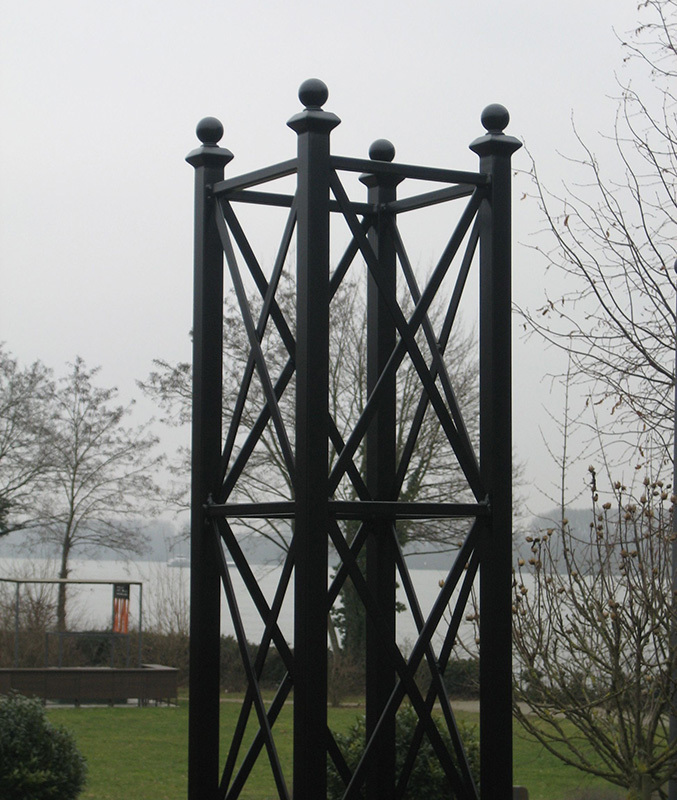 Our four-sided Eltville Treillage Pillar is no exception. Columns were used as far back as the ancient civilizations of Egypt and Persia, Greece and Rome. Over the centuries, rectangular columns have served as tombstones, monuments, milestones and garden ornaments. 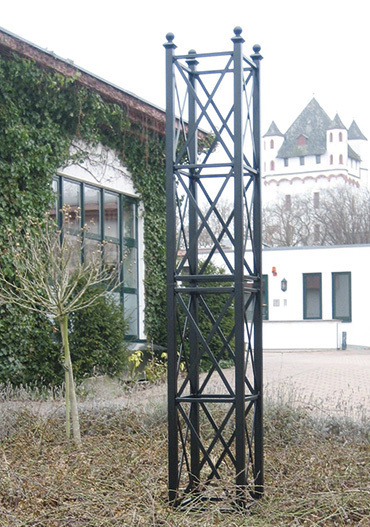 The Eltville Treillage Pillar – a four-sided vertical support frame for climbing plants – is our special tribute to the historic town of Eltville in Germany’s Rheingau region. Eltville is known for its striking medieval rectangular tower, a magnificent rose garden and the once-famous vineyards which supplied Queen Victoria’s Riesling wines. The imposing height of the Eltville Pillar makes it the ideal support for climbing roses in combination with clematis. 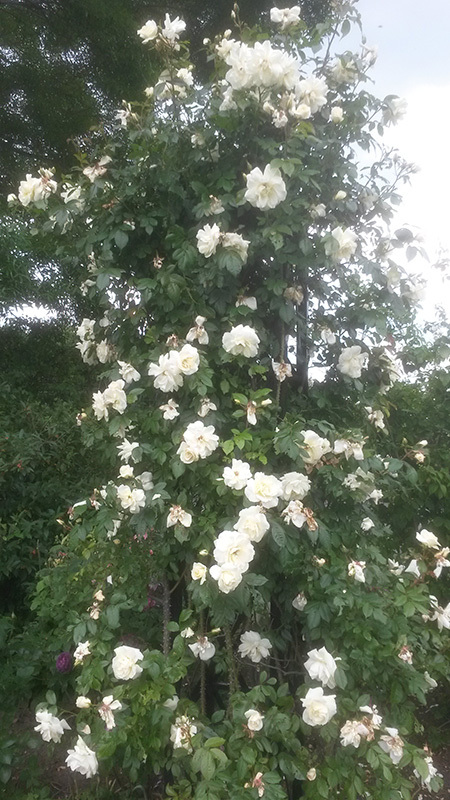 If you wish to plant both, we recommend giving the rose a head start and adding the clematis later. 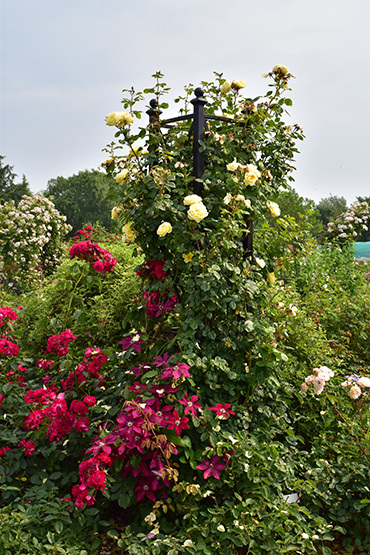 The photo on this page, taken in the garden of Peter Beales Roses, shows a perfect partner for the Eltville Pillar – the bright yellow ‘Stamford’s Sanctuary’ climbing rose, interwoven with vivid red ‘Rebecca’ Clematis. 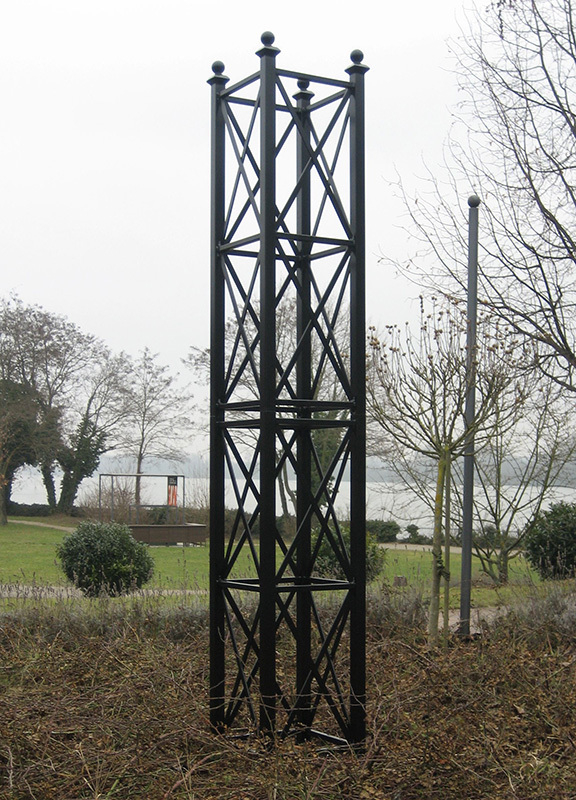 The Eltville Pillar is solidly constructed. When anchored firmly in concrete plugs, it is strong enough to provide plentiful support even to such a vigorous climber as wisteria. It may take a number of years before the first bright violet blue clusters begin to hang picturesquely, but it is worth the wait. 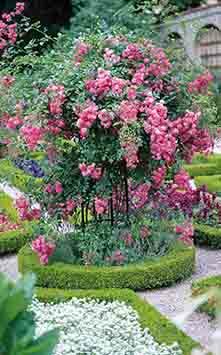 By pruning and shaping the plant twice a year you can be assured of a wealth of blooms in due time. 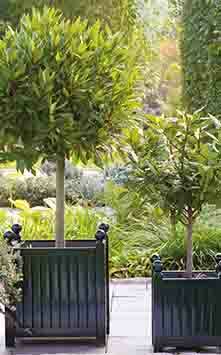 Planted in a warm enough place, certain varieties of wisteria will produce flowers with a delightful fragrance. 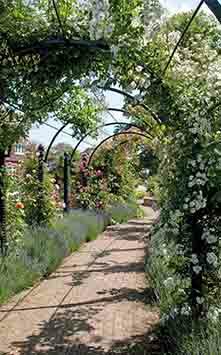 You can enjoy the magic of wisteria in your garden, even if there isn’t enough space for a pergola or arcade. 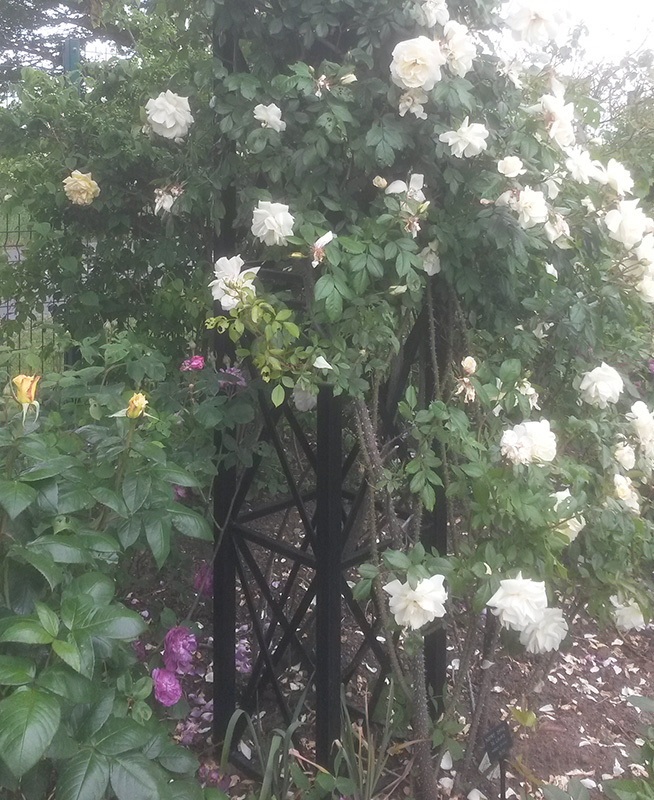 Our compact and sturdy metal rose column will also make this possible.